We are lured by advertisements of different energy drinks in the market. These ‘magic' drinks claim to enhance your workout and performance. Be it energy drinks or sports drinks, they are always associated with power and endurance. But, most of us fail to understand the difference between these two. They contain energy enhancing ingredients, primarily sugar and caffeine. And, these are non- alcoholic beverages. When you drink these, you need to be aware of its caffeine content. These drinks are not suitable for children and those with caffeine sensitivity. Caffeine, being diuretic is counterproductive for replacing body fluids lost during exercise. So, energy drinks usually leave you dehydrated! A person regularly using energy drinks may face caffeine withdrawal symptoms on sudden cessation .Such individuals may experience symptoms like headache, nervousness, lack of concentration and mood swings. Sports drinks on the other hand, provide electrolytes and replace fluids lost during any physical activity. They have about six per cent of carbohydrates in the form of simple sugars like glucose, fructose and sucrose. They also have desirable amounts of sodium too. These drinks are caffeine and alcohol - free. 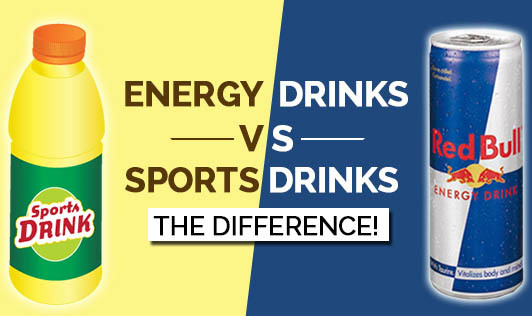 Sports drinks are best suited during physical activity, while energy drinks are not suggested during physical activity. It is better to have energy drinks prior to physical activity, if necessary. To keep things simple, it is best to stick to a good diet and drink enough water during physical activity. Natural juices like coconut water, lemon juice or clear fruit juices can also be a healthy replacement for sports drinks and energy drinks!